The pear, Rocha do Oeste, is being promoted in Paris as part of a new advertising campaign. This Portuguese pear variety will be displayed on 360 billboards spread out through the French capital, between the 10th and 16th of April. 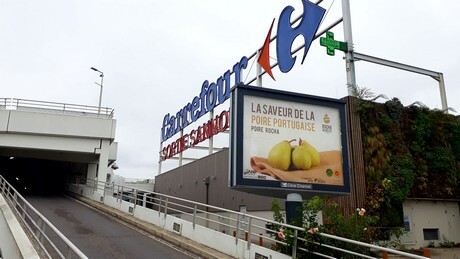 As in the previous promotional action last October, when the Rocha pear was displayed on 340 billboards in Paris, the goal of this initiative for ANP (National Association of Rocha pear Producer) is to bring the French consumer closer to this Portuguese fruit. “The Flavor of the Portuguese Pear, the Rocha Pear,” that is the slogan of this new outdoor advertising campaign. With a close-up picture of the fruit, this new campaign aims at informing the French consumer about the characteristics that distinguish the Rocha do Oeste, such as the carepa (a name given to the brown spots, solid at the base and irregularly scattered upwards). Simultaneously, the campaign also aims at showing that the Rocha pear is still available on the French market, a few months before the start of a new production season. This promotional campaign is part of the project “Promotion of the Rocha pear on foreign markets”, through which ANP hopes to increase the international visibility of the Rocha do Oeste and its country of origin. The goal is to contribute to an increase in exports, thanks to a stronger marketing abroad and a better knowledge of the target markets, and to stimulate the evolution of the sector in the value chain. The project is co-financed by Compete 2020, as part of the Competitiveness and Internationalization Operational Program. The total investment is 430,902 euros [486,473 USD], 85% of which come from the European Regional Development Fund (ERDF). ANP, the National Association of Rocha pear Producers, whose headquarters are located in Cadaval (Oeste region of Portugal), has 29 partners. It covers 86% of the Rocha pear production in Portugal. Founded in 1993 to coordinate and promote a quality policy for this exclusively Portuguese fruit, it is the managing entity of the Protected Designation of Origin (PDO) “Pera Rocha do Oeste”.